Waldorf classrooms have two very special visitors in December. Bishop Nicholas and his old pal, "Rupert" arrive to give out gifts and more. Make no mistake, one is here to praise the "good" children while the other is here to embarrass the "bad" children. First let's see who we are talking about when we say Bishop Nicholas and "Rupert". 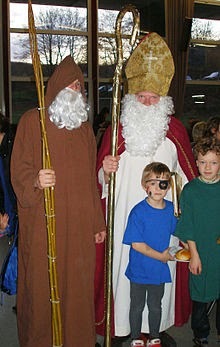 Our good friends at Wikipedia have provided us with a list of many "companions" for Bishop/Saint Nicholas. In Waldorf schools we have "Rupert" who, from my experience is a combination of elements from all of these. Krampus"Krampus is a terrifying figure found in parts of Austria, Slovenia, and Croatia," "As a part of a tradition, when a child receives a gift from St. Nicolas he is given a golden branch to represent his good deeds throughout the year; however, if the child has misbehaved, Krampus will take the gifts for himself and leave only a silver branch to represent the child's bad acts." 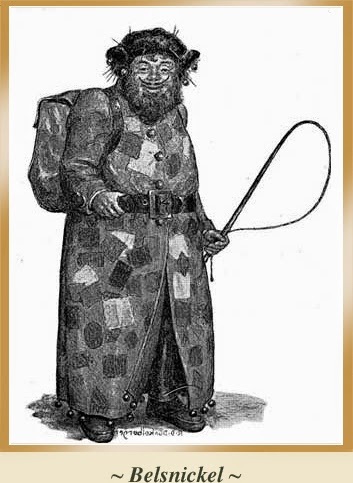 "Belsnickel is a companion of Saint Nicholas in the Palatinate (Pfalz), Germany." "He is a rather scary creature who visits children at Christmas time and delivers socks or shoes full of candy, but if the children were not good, they will find coal and/or switches in their stockings instead." "In Belgium and the Netherlands, children are told that Zwarte Piet leaves gifts in the children's shoes. 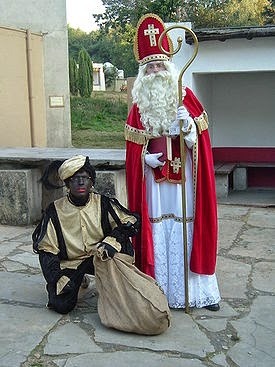 Presents are said to be distributed by Saint Nicholas' aide Zwarte Piet; who enters the house through the chimney, which also explains his black face and hands, but not his colorful attire." "Knecht Ruprecht sometimes carrying a long staff and a bag of ashes, and wore little bells on his clothes." 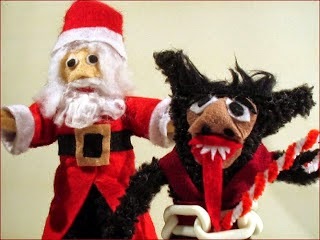 "Ruprecht was a common name for the devil in Germany, and Grimm states that 'Robin fellow is the same home-sprite whom we in Germany call Knecht Ruprecht and exhibit to children at Christmas...'" "Knecht Ruprecht first appears in written sources in the 17th century, as a figure in a Nuremberg Christmas procession." "According to some stories, Ruprecht began as a farmhand; in others, he is a wild foundling whom St. Nicholas raises from childhood. Ruprecht sometimes walks with a limp, because of a childhood injury. Often, his black clothes and dirty face are attributed to the soot he collects as he goes down chimneys." As it turns out, I have intimate experience with Bishop Nicholas and this Rupert character. Back in my Waldorf years, I was the Bishop Nicholas character for a neighboring Waldorf school (The City School in Los Angeles). I saw first-hand how this tradition was carried out in a modern Waldorf school. Rupert, or Black Peter is portrayed as a sub-human, black, devilish, wild, savage, unwashed and intended to frighten the children. It has nothing to do with chimneys and neither does Bishop Nicholas in this tradition. He is typically dressed as a bishop, robes, religious garb, carrying a book with the children's names in it. If they have been good, they get a gold piece (foil wrapped candy or treat). If they have been bad, they may get a piece of coal. 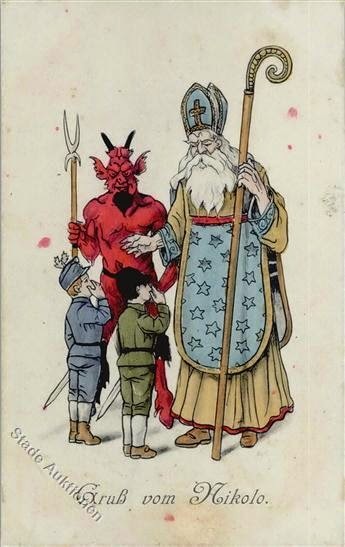 Bishop Nicholas is the all-knowing (knows when you've been bad or good) type of Saint Nick who carries a large book - a balance sheet of sorts - to express to each child that he is aware of their behavior throughout the year and that they need to continue being good or improve. "Rupert" is intended to represent a sub-human and always depicted as dark skinned, disruptive and frightening. His role is to annoy and frighten the children who Waldorf teachers have singled out for punishment. He is always subservient to and held in control by Bishop Nicholas. As Bishop Nicholas reads out each child's name, Rupert recommends a lump of coal for the child. Bishop Nicholas wisely points out the good aspects of the child's character and rewards the child. When I was Bishop Nicholas, I often provided my own gifts for each and every one of the children. The Waldorf teachers at that school regularly singled out children who they expected me to embarrass by giving them a lump of coal instead of a golden walnut. I regularly ignored their wishes. At the City School, one year, my regular Rupert couldn't make it so they enlisted the help of a parent. The parent was dark skinned and the teachers there had no reservations about explaining that this was one reason why she was chosen. That punctuated the inherent racism in what seemed like a slightly cruel but relatively harmless, albeit outdated Waldorf tradition. Obviously, that was the last year I did this. The juxtaposition of the pure Bishop Nicholas with the dirty Rupert is what Waldorf is trying to achieve here. The Bishop is supposed to be gentle and quiet (like "good" students) - while Rupert is wild and rambunctious (like "bad" students). It isn't Rupert's fault - he was raised in a barn after all... by the good Bishop who, with patience and gentle care, is guiding Rupert toward a better life... Not too much unlike how Waldorf teachers take in children who have been "raised in a barn" so to speak before their parents found Waldorf. Insert emoticon with eyes rolling. Are you suggesting there is something inaccurate here? Perhaps you are better-advised about this topic. Care to share? Or is eye-rolling the best you have to offer my readers?